Gorgeous ONE OF A KIND custom waterfront 3 bedroom, 2.5 bathroom home now available! This home was built in 2016 and is fully upgraded. 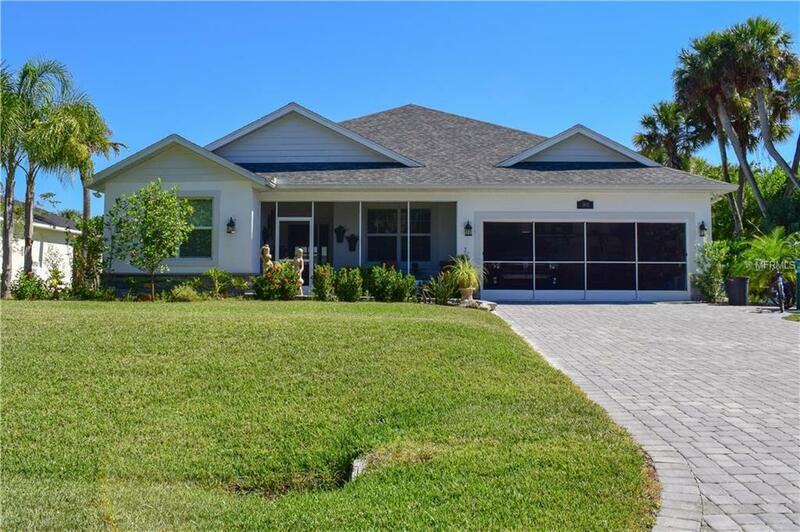 Located on a wide freshwater canal right on the North Port border in an area of newer homes. You are greeted by beautiful landscaping and the oversized brick paver drive way. Upon entry you pass through the newly enclosed front patio which is great for enjoying your morning coffee. Step inside and immediately be wowed by the beautiful large travertine tile floors, tray ceilings and crown molding in the main living area. A true open floor plan living area complete with a stone faced gas fireplace, custom kitchen with level 5 granite counters, stainless appliances and walk in pantry. This split plan home has a spacious master suite and two bedrooms, one of which is currently used as an office with lots of natural light from the giant windows and elegant French doors. The living room, dining room and master bedroom all open right onto the newly expanded screened in lanai. This provides great natural light as well as a private and peaceful view of your mature landscaping, dock and the calm waterway. There is plenty of storage with the custom shelving in the garage and large shed with electric that would make a great workshop. This impeccably well-kept property is a must see that won’t disappoint!